Etisalat Easy Life 4.0 tthe Best Tarrif Plan - The Tech Evangelist! Etisalat Easy Life 4.0 tthe Best Tarrif Plan - The Tech Evangelist! Though this is not a review but it seems this is one of the cheapest Etisalat Plan so far. I know there promo of Recharge and get 100% of your airtime is still running on every Etisalat plan. This plan has constantly been update and now its Easylife4.0. 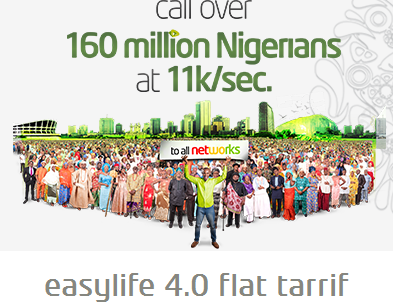 The New Easylife 4.0 Limited Edition offers 11k/Sec to call any network in Nigeria, and 20k/sec to 4 international destinations (UK landlines, US, China, India). still checking this out sha.